Do you want a vehicle with a smart key or keyless entry? They sound interchangeable. But they are not entirely the same. When you buy a new car or need to list an old one for sale, it's important to know what you're buying or selling. And these two terms may come up often if you are buying a newer car. So, if you're confused about the differences between a smart key and keyless entry, you've come to the right place. Find out everything you need to know about both of these features. And decide for yourself which one works best for you. Keyless entry, sometimes called passive entry, allows you to lock and unlock your car without using a regular key. It also includes not pressing any buttons for remote entry. Vehicles equipped with a keyless entry feature still come with a key. But you don't need to use it. Older passive entry cars may require you to put the key in the ignition before pressing the Start button to turn on the ignition. But newer cars have more advanced keyless entry technology that allows you to press the ignition button when the key is still in your pocket. A smart key takes auto technology one step further. It's still keyless entry technology, but it's a little more advanced than a standard PKE, or passive key entry, remote technology. Smart keys have a special chip inside the key fob. And your car recognizes the chip via a radio pulse generator. The radio pulse travels through your car's built-in antennas and allows you to do standard things such as lock and unlock doors and start the ignition. With a smart key, you don't need to press a button to do things like lock or unlock your door. Your car senses your proximity and automatically tends to your doors for you. 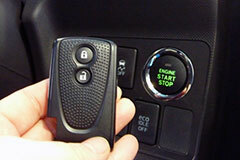 In addition, many smart keys also start your ignition without you having to press a button on the remote. If you lose your smart key, you can reorder another one. But it isn't as simple as going to a locksmith for a copy because you need a fob with a specialized chip. So what are the differences between a smart key and keyless entry? Both are technologies that allow you to lock and unlock your doors remotely. You can also use both technologies to remotely start your car, to varying degrees. Furthermore, a smart key can qualify as keyless entry, but not all keyless entry fobs are smart keys. Smart keys allow for more remote actions than a standard keyless entry fob. With smart keys, you can lock or unlock your doors depending on the proximity of your car without pressing a button. The chip in a smart key may also calibrate settings and preferences depending on the last user that used the fob. On the surface, you may use keyless entry and smart keys interchangeably. But keyless entry is more like a general reference to passive keyless entry. It can encompass any technology or fob that allows you to unlock and lock doors without using a traditional key. Smart keys, on the other hand, take keyless entry one step further. These special fobs allow you to do more things and you don't have to use a key or press a button to do it. The technology behind smart keys allows it to remember preferences and settings for your convenience. And that's something that standard keyless entry features don't have.